Today was a driving day. 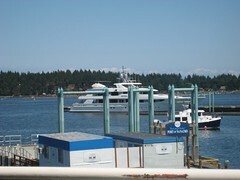 We left Chemainus about noon (hey, it's a VACATION!) and headed for Port Hardy, on the northernmost point of the island. We had no intention of getting there, mind you, but it was a good destination to input into the Garmin. Remind me to extoll the virtues of GPS navigation one of these days - it's a giggle to veer off the prescribed route and have this voice say "Offroute. Recalculating." The Roketman has added on the option to get Sirius satellite radio through the Garmin, and it interrupts the music to give directions. Except, at one point, it sounded like the voice gave us a raspberry. I'm sure it was just the music, but still. 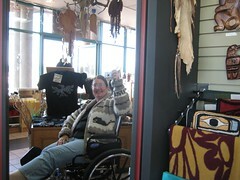 We had lunch in Nanaimo, and I found the sweater I've been looking for, a genuine Salish-knitted sweater. The woman who owns the shop was married to one of the tribe, and still has contacts there. Needless to say, this was the highlight of my day. I did wear it back to the car, because I was COLD! from the air conditioning in the restaurant. I did get a lot of strange looks from other people. If anyone had asked, I'd have said "We're from Los Angeles" and they'd have nodded their heads. We do have the reputation of being crazy, us Hollywood types. I love your new sweater! Bring it to knit night on Wed. ...if you're home and can get Hubby to drive you. Oh MY! I was just catching up on your blog and see that you've had quite a vacation! OY! I'm glad that you're the person that you are, can take all the mishaps in stride, and continue to have a good time. But OY! I hope you come back in one piece. Who is this graceful woman?